The White Patong is a simple and clean hotel ideal for travelers on a budget who want to be next door from the nightlife hub of Phuket. The hotel is just located just off the Bangla Road junction and 5 minutes walk to the beach. Rooms are a bit small and you may get one without a window, amenities found inside include a comfy king size bed, big fridge, flat-screen TV, good A/C unit and a wet room offering constant hot water. the only other furniture is an old dark wardrobe, bedside the cabinet and a safe, there was no other facilities to make tea or coffee or toiletries. No pool, no lift. Restaurant downstairs is pretty good and cheap as well. 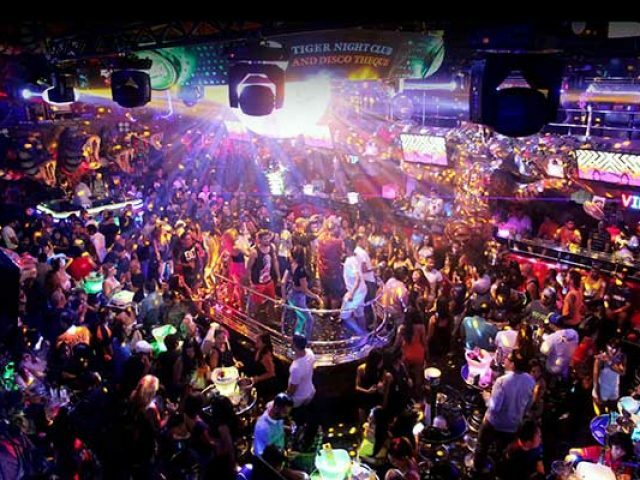 The Acca Patong is a 3-Star that offers pretty good value, just 5 mins walk to Bangla road and 10 mins from the beach. the rooms are clean, the beds are comfortable and come with quality linen and pillows, aircon worked really well, modern toilet where the hot shower was working, flatscreen TV with English channels, staff is nice. Location wise, it is not the best as it is a good 15-20 mins walk from Bangla Road and Patong beach. Rooms have a stylish design and excellent lighting, bed is quite comfy and I liked the way they designed a small living area in front of it. Hotel amenities include a rooftop pool area on two levels, one to hang and chill in the open and the other with the pool itself. The Amata Resort is right in the center of Patong, within walking distance to everything. Rooms are spacious and well appointed with a balcony overlooking the pool. The Anchalee Inn is an older 3-star hotel with budget friendly prices all year long. Rooms aren’t exactly the most up to date but the beds are fine and housekeeping comes to clean daily, amenities are very basic and include a small fridge in the room, older generation TV, quiet air-con unit, balcony overlooking the pool and a wet room. Staff are very friendly staff and the food served at their restaurant is quite good. Nothing fancy about the Apsara Residence, another cheap 3-star hotel in Soi Sansabai that’s easy on the wallet. 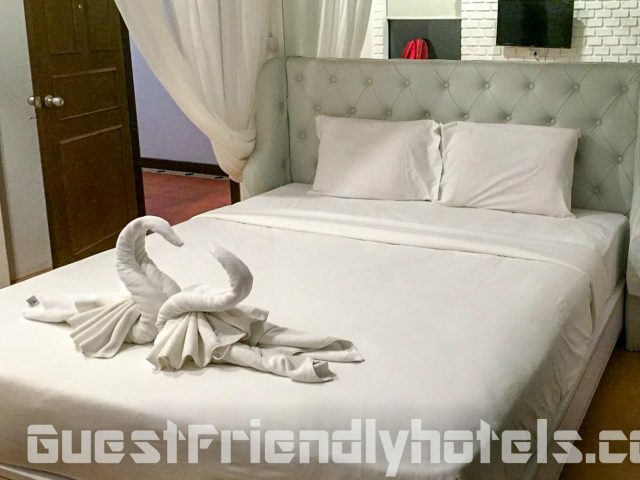 No luxury appartements here, rooms are basic, a bit outdated and far from fantastic but the place is kept very clean and the bedding is comfy with a quality matress and linen, location is great if you are here to enjoy the nightlife as you are within a two minute walk from Bangla Road. The Aspery is a great little 3-Star Hotel with clean and tidy rooms, above average for the rates. Located just a few mins walk from Patong Beach, it also has a rooftop pool which offers plenty of space for lazying around. Older 4-Star Hotel currently closed for complete renovations right on Patong beach with pool and bar facing the beach, big rooms and hard to beat location having both the sand on your feet at one end within a 100m walk to Bangla Road. Budget 3-Star hotel just 5 mins from Bangla Rd with a rooftop pool access at another hotel. Rooms are basic but clean, prices usually very decent as well. Poppa Palace is tucked away in a small soi just around the corner from the hustle and bustle of the Patong’s main road approximately 10-15 minutes walking distance from both Bangla Road and the beach. The hotel amenities include two small swimming pools next to each other separated by a small walk way with a bar in the middle, grounds are quite nice with little koi ponds and Balinese style statues. The first pool is shallower and more for kids with families, second is tucked deeper inside and more relaxing. I stayed in a Deluxe studio with balcony and the room was great, lots of space to move around with a big comfy bed, flat screen TV, safe, fridge, quiet and cool air-con. Bathroom is just your typical Thai wet room but there was no shortage of hot water, Wi-fI connection can be a bit slow at times but overall very reasonable price, I would definitely recommend this little 3-stars hotel. What you see above are the actual pictures I took when staying in their Deluxe studio room. The R Mar Resort and Spa is a quiet little gem with huge outdoor pools surrounded by a lot of greeneries in a very busy area of Patong. Rooms are lovely and of classic design with rustic furniture but equipped with all required modern day amenities needed including a big comfy beds, large LCD/plasma screens, Mini bar offering some complimentary free drinks for guests (the usual free water but also beer and soft drinks that are replenished daily), free wifi and a nice big balcony to chill on. The Royal Phawadee Village is a little a little oasis of peace just minutes away from the from the hustle and bustle of Patong. Location is great, just 3 mins walk to the beach and 10 mins to Bangla Road. This older resort was built in traditional Thai style architecture and is set amid lush tropical gardens, pool is well maintained, clean and refreshing. My deluxe room was on the second floor with a veranda overlooking the pool. Living space is around 30 sq.m, everything is clean and fully functional, king size bed is comfortable and comes with very clean linen, flat screen TV, well stocked mini-bar and a balcony to sit on and enjoy a drink, toilet separate from the shower room. Staff are laid back and very friendly, will definitely return. Have a look above for the pictures I have personally took during my stay of the room and hotel amenities. Location is good as it’s tucked away in a quiet alley off Soi Sansabai, just 5 mins walking distance from Bangla Rd. Rooms are a bit small in size but clean and comfortable with all the basic amenities are included: Led-TV, mini-bar, Air-con, powerful shower was powerful, fridge ,safe and a small balcony. Worth it’s money. Location of the Lantern Resorts is super convenient, only a short 5 minutes walk to Bangla Road and 5 more to Patong beach. This is currently my favorite resort on Soi Sansabai, facilities are new and modern and there’s three pools to chose from, two are at ground level next to each other and one on the roof. I booked the Pool Pent room, which are big and spacious with direct access to the pool from your terrace door, there is a table and chair outside and its very nice sitting there with a drink and a following dip. Rooms are clean, bright and comfortable and the housekeeping maintained it regularly, bathroom has a separate walk-in shower and tub. Could not be any happier from my stay at The Lantern Resort Patong, clean facility, perfect location and great staff, recommended! Have a look above for the pictures I have personally took during my stay of the room and hotel amenities. The Yorkshire is a newly refurbed British owned 3-Star located just a minute walk from Phuket’s nightlife center, the infamous Bangla road. While the hotel doesn’t claim to be 5-stars or in the luxury category, it does stand out from other 3-Stars in the area due to the amount of facilities they offer for a hotel of this size and price. The Yorkshire has two saunas, an excellent gym and a pool where staff members always look after you, making sure we always had a drink and were happy. Food served is great and prices moderate. Tiger Inn hotel is a budget hotel is found right above a jungle themed restaurant and bar of the same name. 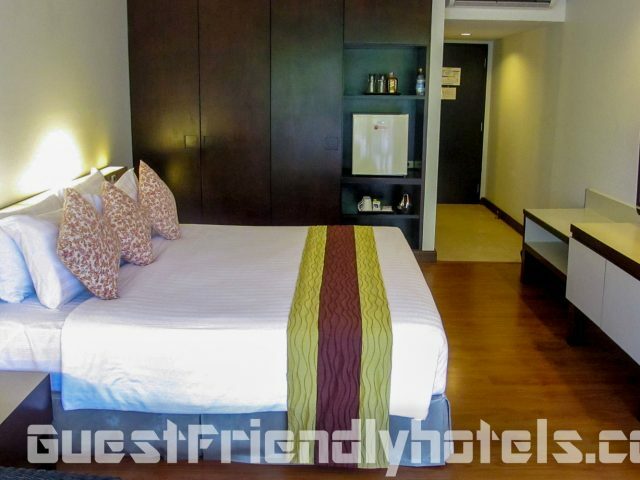 Location is quite central with Patong Beach & Bangla road only a short 10 minute walk away. Rooms are old fashion but clean and spacious, decorated with sweet tiger-striped bedding and furniture. Definitely nothing special but all the basics are covered and everything works. The menu at their restaurant has a huge selection ranging from Thai cuisine to Western food with lots of fresh seafood dishes, good servings as well. A live band plays every night in the restaurant & bar, singing mostly classic rock covers from the 70s & 80s, so it can quickly fill up on occasions with an international crowd. Ideal place for travelers on a budget, if you don’t mind the tired rooms and lack of a swimming pool. Have a look above for the pictures I have personally took during my stay of the room and hotel amenities. The @Home Boutique Hotel is a great option for travelers looking for affordable rooms not too far away from Patong’s nightlife. Location is quiet, walk to Bangla Road only takes 10 minutes. Definitely not the Ritz, but rooms are very reasonable and larger than I expected at 32 sqm for this price category. All the basics for a comfortable stay are provided: Cable TV, mini-bar, air-con, small electronic safe, bedding is decent, shower pressure in the bathroom was excellent, every room has a balcony. Now for the downsides: Noise isolation is poor, while there’s a lot of channels to chose from on the TV reception is a little fuzzy, Wi-Fi disconnected frequently, bathroom very basic in Thai style with no curtains so it floods the whole place quite easily, not the most silent of Air-cons. In the end still a good bang for your buck, should suit just fine those travelling on a budget. Have a look above for the pictures of the room and hotel amenities. 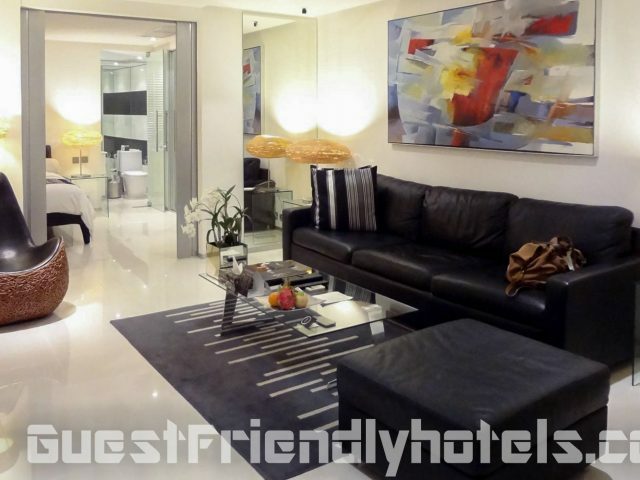 3-star hotel with pool, 850 m from Bangla Rd. 3-Star hotel with outdoor pool near Bangla Rd. The Jang Resort is a 3-star property tucked on a quieter side street with little to no motor traffic surrounded by many happy ending massage parlors, bars and restaurants. 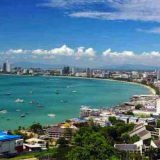 Location itself is great as it allows you to easily access the best of what Patong has to offer: Beach, Bangla road nightlife, Jungceylon mall, Hooters and the Hard Rock Cafe are all within a 5 to 10 minutes walk. The Resort is small in size with only 25 rooms spread around a small but adequate pool. Rooms are cozy and clean but furnished with older amenities, bedding quality is very decent, bathroom is the part that is really starting to show it’s age but nonetheless still fully functional. Almost all the rooms on 1st floor rooms open up onto the pool and are equipped with chairs and a table to sit outside. Facilities are limited to a pool, bar and restaurant. Overall a great little oasis with a shaded pool only 100 meters from the beach and 300 meters from the nightlife with older but decent rooms, those looking for modern resort will definitely have to look elsewhere. Have a look above for the pictures of the room and hotel amenities. 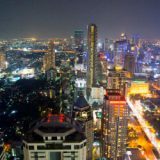 3-Star hotel with rooftop pool near Bangla Rd. 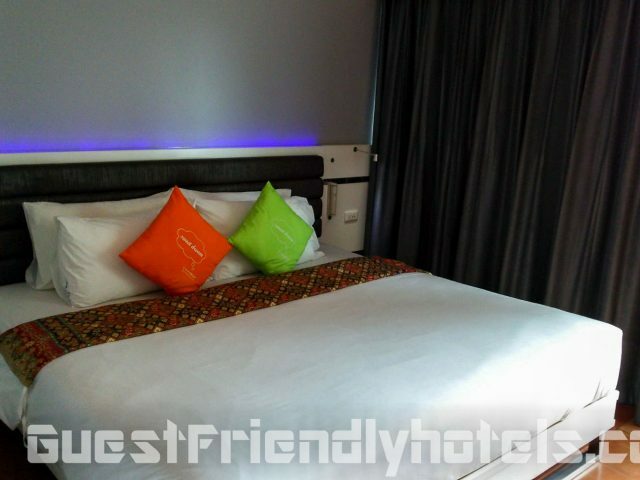 3.5-star hotel with pool near Bangla Rd. Large 4-star resort with pool near Bangla Rd. The Patong Studio Apartments offers of mix of dorm style rooms and studio appointments, from the outside the building looks far from inviting, common areas inside are not much better with dark and dingy corridors and slow elevators that take forever to get to their destination. Luckily the idiom not to judge a book by its cover comes to play here and the studios or one bedrooms apartments they offer are in better shape. Make no mistake, these are still low budget apartments but everything is functional. Room are kept clean and tidy, beds are comfortable, amenities include a big LCD TV with cable, kitchenette equipped with a microwave, stove for cooking and a large refrigerator. Big wardrobe for storage, good air conditioning and a somewhat patchy WiFi. Location is ok, a bit set back from the main road about a 10 min walk away from Patong beach and 15 min away from Bangla Road, no noise at night. Overall not bad low budget apartments but the outside of the building is an eyesore and in seriously needs a revamp. Have a look above for the pictures of the room and hotel amenities. PJ Patong Resortel is conveniently tucked off from the main road down a quiet little cul de sac, so while the location is quite central, 10 minutes walk from bangla road and around 15 mins from the beach, exterior noise is very minimal and won’t disturb one’s night rest. Rooms are very well maintained with lots room for you to unpack your luggage, bedding comfortable, amenities modern: Cable tv, fridge below it, safe, kettle, internet worked well enough (few disconnects), showers were warm, all the your basic needs covered. Hotel is small in size with only 32 rooms spread over 6 floors, facilities are far from extravagant and are limited to a swimming pool with sun terrace on the top floor and a restaurant/bar on ground floor. Pool is small in size and only good for a refreshing dip, still a nice place to go and relax enjoy the city and mountain view. Friendly staff, Everyone knew or at the very least understood English. In the end: Very close to the nightlife, not far from the beach, rooms cleaned everyday, good value for money. Have a look above for the pictures of the room and hotel amenities. 3-Star hotel with pool near Bangla Rd. 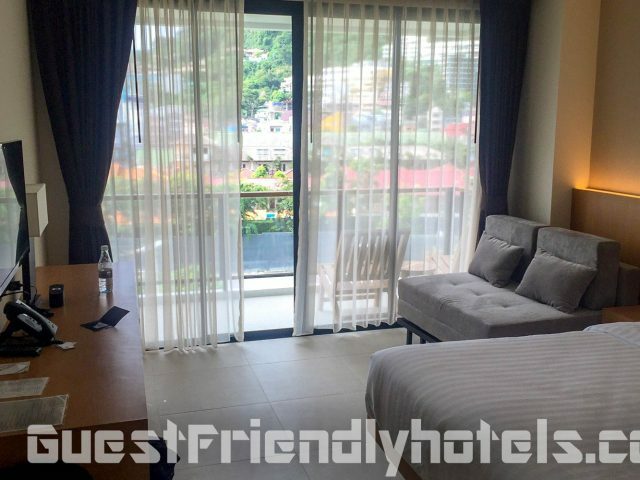 The Silver Resortel is a great little inexpensive 3-star hotel with a very central location, just a few minutes walk from Patong beach and at most 10 mins from the naughty nightlife of Bangla Road. Rooms are slightly on the smaller side but well maintained and furnished with all the essentials: TV, mini bar, A/C, safety deposit box and WiFi. Only thing missing that I noticed was the tea and coffee, strangely they only provide the electric boiler. Beds are your typical Thai style, a bit firm for westerners but nonetheless comfortable. Staff are friendly and can speak and understand basic English. Trade-off are the facilities, which are limited to a restaurant and bar but honestly for this price and location in Patong you will be hard pressed to find a better deal. Awarded year after year the Certificate of Excellence award by TripAdvidor, I can definitely recommend the Silver Resortel to anyone on a budget coming to Patong. Have a look above for the pictures of the room and hotel amenities. The Sira Grande Hotel is a lovely modern 4-Star Hotel just a block away from all the action. Bangla Road, Patong beach and the Jungceylon Shopping are all within an easy 5-10 minutes walk. 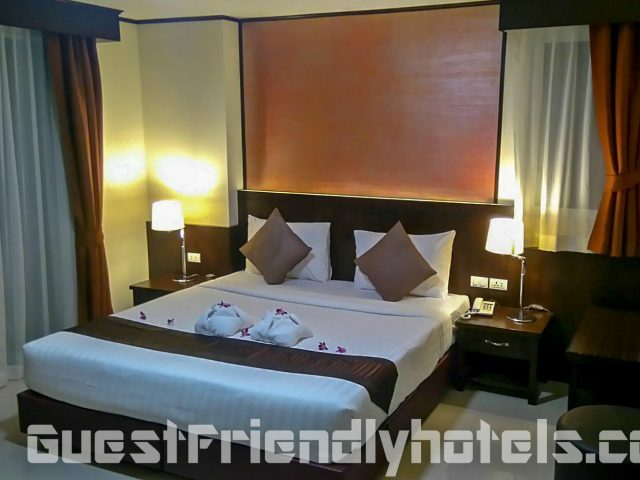 Rooms are well designed, not the biggest in size but have comfortable beds with high quality linen. Amenities offered are quite decent: Flat-screen TV with numerous English channels, good powerful air conditioner, well stocked mini-bar, electronic safe, lots of power points, good view from the balcony, complimentary water, coffee, tea and sugar everyday. Just minor wear & tear noticed, small scuff marks on the walls from suitcases/bags but nothing to worry about. Facilities include a nice little rooftop area with pool and bar, great spot for catching the sun rays, lots of sun loungers and beanbags to sit and relax on, good daily happy hour with cheap cocktails, food available. The fitness area is poor, but ok for a little basic exercise. Restaurant downstairs is good, though a little expensive, staff always on hand to assist. Overall it was a very good experience. Have a look above for the pictures of the room and hotel amenities. 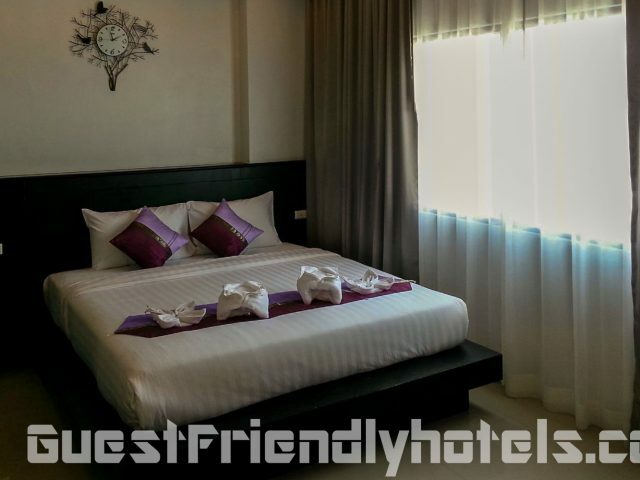 The Front Hotel and Apartments is very appealing in terms of location, across the road at the quieter end of Patong just 10 meters from the beach. Bangla road is about a 15 minutes walk from here. The hotel is split in two 4 story blocks, one building with apartments/suites and the other with more regular hotel rooms. The apartment category are particularly spacious and offer fantastic panoramic sea view from it’s glass fronted rooms and balconies. In comparison the rooms in the regular hotel building are just average, decor could really do with a refurb. Further more this part has no elevator, so those 3rd or 4th floor hikes up and down can get quite annoying after a while especially for older guests. Hard to really recommend, best suited for those who are looking for a location right across from beach. The sea view alone from some apartments could justify the price, otherwise quite average. Have a look above for the pictures of the room and hotel amenities. The Lunar Patong is a newly-opened 3.5-Star property located right on the main road near the northern end of Patong, just five minutes from a very nice area of the beach and within a 10 to 12 mins walk from the bustling nightlife of Bangla road. The resort is only about 3 years old so all the amenities are modern and new. Facilities highlight is the infinity pool with sundeck that runs across the length of the building. Rooms have a good feel, some with direct access to the swimming pool. Rooms are quite spacious, furniture and finishes are new with a nice comfortable design. Amenities include: 32 inch flat-screen TV, small couch, mini-bar, WiFi, safe, coffee/tea making facilities, small private balcony with table and 2 chairs. Above average, great location near the beach, nice pool, good overall value. Have a look above for the pictures of the room and hotel amenities. Tony Resort is an older property with a great location slap bang in the center of Patong, 3 minute walk to the beach down a small alleyway and 5 minutes from Bangla Road. The resort has two separate buildings, one looking overlooking the pool and another at the back. Pool itself is large and very relaxing with ample deck chairs with umbrellas, opened late until 10PM and extremely well maintained, good in-house restaurant and bar, breakfast buffet is nice, but basic, WiFi good and reliable. Rooms were very spacious and clean but are seriously starting to show their age with the dated decor and furniture, not a massive range of channels on the old style crt TV, kettle in room but missing the coffee and tea, showers hot with good water pressure. Overall great location close to everything, nice pool are but older resort and rooms in need of some serious TLC. Have a look above for the pictures of the room and hotel amenities. © 2017 Copyright. 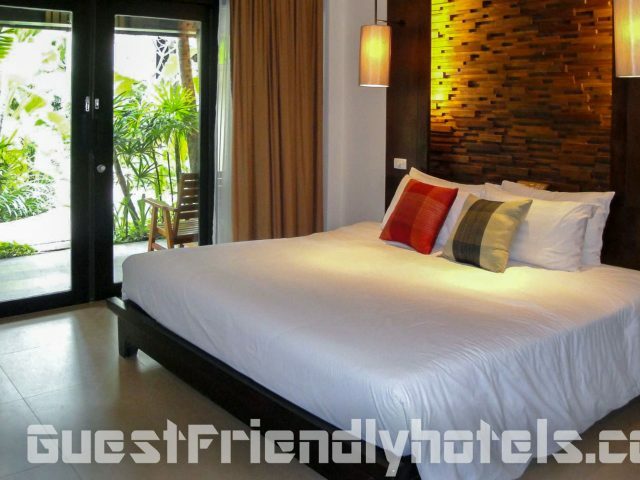 GuestFriendlyHotels.com :Your Directory to all the Guest Friendly Hotels of Thailand.